Well, dear friends and family in Christ – by the time you receive this month’s prayer/newsletter we will be much closer to Springtime (if not already in it). That is always a wonderful thing! Winter, it seems, is always pretty much a time of year that we are glad is over. Thank you, Lord. We’re just a month away from beginning, once again, with our April Saturday work days in order to prepare for another season of camps. There is always much – physically speaking — that needs cleaning, fixing and straightening up before we start bringing the boys and girls onto the campground. Our Lord and Savior tells us to cast all our cares upon Him – because He cares for us – so please include all the maintenance tasks that need to be completed in your praying for us. Thank you. Some potentially really good news is that a couple of churches have called and requested us to schedule a visit with them to speak to their young people’s classes about maybe helping us on staff for this summer. This open door to do that is, indeed, an answer to all our prayers! Thank you, Lord! Please continue to pray with us that we may successfully recruit some good candidates for both boy and girl helpers. It is so exciting – and so encouraging – when this sort of thing happens. Once again, Thank you, Lord! Also, some responses through the internet have already come to us from campers who want to come to camp this year. Please – especially – remember to pray for all the children whom our Lord will send to Camp Del-Haven this year! Pray that He prepares their hearts to sit under sound teaching of the pure truth of the gospel of the glory, only, of the Lord Jesus Christ. All our efforts to “evangelize” the souls that the Savior sends to us – will be completely fruitless without the Holy Spirit of God going before us and directing our path; and it is He that leads His people to earnestly and prayerfully seek Him to do so. He does it all! This is why you all are so important to us! Once again – remember – God has orchestrated it so that this ministry was founded on prayer – and it has been sustained for 6+ decades by prayer! Thank you, dear ones, for your faithfulness in praying with us and for us. We love you…and we pray for you as well. Well, dear friends and family-in-Christ, as we are putting this prayer letter together – there is once again an icey layer all over the limbs of the trees as well as the campgrounds and the roads. Both driving and just walking around in these kind of conditions is precarious – to say the least! O Lord please keep us all safe and sound through this adverse weather! We wish to give all praise and glory to our wonderful Lord for the fact that He has caused the final touches in the completion of our new kitchen to come to fruition! The men skilled in installing the granite counter tops have made it out to the camp and have done an exemplary job! We pray the Lord’s blessing upon Don and Mark for their fine workmanship. The new Del-Haven kitchen looks absolutely fabulous! Our God is indeed so great and so good! Also, the response of love gifts to Del-Haven in memory of the passing of our dear brother, Steve Mason, have been extraordinary. We thank our Savior for all those who have lovingly remembered Steve in this manner. We still want to encourage everyone to continue to remember to pray for Sherry’s comfort and keeping and provision as well. With the renovation that has been done on the Camp’s restroom facilities – and the new kitchen that we now have – it’s going to be interesting to see what our Lord God has in store for us in the up and coming 2019 season of camps. For this reason we really need your persistent prayers for all the boys and girls that the Lord is going to send to camp this year. 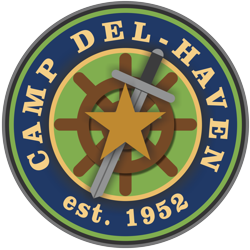 We printed out our 2019 schedule of camps in last month’s newsletter, but you can always find it on our website at www.campdelhaven.org – check it out. Please remember to seek the Lord with us for His choice in whomever we have serving on our staff. Don’t forget – we especially need good male helpers! Thank you for your faithful, loving prayers for us. They mean so very much to us…we love and pray for all of you as well. 2018 giving receipts were mailed out the last week in January 2019. If you notice any errors or you did not receive one, please contact us. Dear ones, it is with bitter/sweet emotions that I report to you of the passing into glory of another of the Del-Haven family. Dr. Steve Mason went to be with the Lord on December 28, 2018. He was a loved and dear friend of mine (and of our whole family). Steve and his wife, Sherry, served on our Board of Directors — as well as always being faithful supporters of the ministry. Steve was first of all – a Christian – who happened to also be an excellent chiropractor – one of the best! We have many blessed memories of our dear brother in Christ. Please, dear family-in-Christ, remember especially — to pray for Sherry in this season of sadness and worldly adjustment — that only the comfort of the Holy Spirit can lead her gently and safely through. Thank you in advance for doing so. As always, may we remind you to be in prayer for our staff helpers? Please pray for those we know are returning – and for those that we need for the Lord to lead unto us (especially male helpers). The number of our staff help directly determines the number of campers we can accommodate. These are the ones on the front line in the spiritual battle where the souls of the children are concerned. This is an ongoing need. Special thanks to those of you who have specifically responded to the mattress cover expense. For this – we say – Praise the Lord! Jeff and I discovered a couple of trees that we needed to trim and take down. The degree of difficulty in accomplishing this task was more than we could handle. So we prayed for the Lord to help us. A few days later I got a knock on the door and it was a young man who told me he was with a new tree service – and he was going from house to house seeing if there were any trees that people needed help with. I asked him if he could follow me and led him to the trees that were a threat to Jeff’s home. We had just received a gift that was the exact amount for what they announced would take care of our tree problem. Again, Praise the Lord! He always is eternally faithful and true! If you, or someone you know, is interested in serving the Lord with us this summer, please have them call Sheri at 816-690-8465 or email sheri@campelhaven.org for more information. 2018 giving receipts will be mailed out before the end of January 2019. If you notice any errors or you do not receive one, please contact us. Well, dear ones, it’s hard to believe we have come to the end of 2018! We have had a couple of light snowfalls already – and it is not yet officially Winter. But, the Lord truly is gracious – the crisp and cold air smells so clean and good. As we look forward to the approaching of 2019 – we continue to earnestly pray for the Lord to provide a fresh new influx of good male helpers! We also do not want to forget our good female helpers that we still have on board. They need constant prayer as well. Your faithful prayers are so important to us…and, to our staff…and to all the boys and girls that we have ministered to — and that we will be ministering to! Thank you so much for being there for us as you are. Guess what! We have had given unto us some beautiful granite countertops. However, they have not yet been installed. This is because it takes some special skilled labor to accomplish this job. The countertops have been simply sitting in a corner of our Dining Hall – waiting for the Lord to send to us the ones that can work with them and get them installed for us. Finally, the Lord has sent us someone who can fulfill this task. Whether or not this will get done (like anything else) will be up to the Lord’s moving. Please remember to pray with us in this regard. It will make for a very nice finish where the renovation of our Kitchen is concerned. We will keep you updated. One other thing – we already know that we will be needing some new plastic mattress covers for many of our beds. What we need is 40 new covers. They cost about $7.00 each. We are praying for the Lord’s leading and provision where this particular need is concerned. Your faithful support in prayers and gifts is greatly appreciated. The cold weather causes a lot more need for propane gas. We try to keep the wood stove going as much as we can to help cut down on the gas furnace. The Lord knows our needs even before we ask…yet He commands of us to cast all our care upon Him because He cares for us. Praise the Savior! We hope and pray that you all have a very blessed and joy filled Christmas time of year! Well, dear friends, our God continues to faithfully bear testimony unto us that He hears and answers our prayers. Some of the men from First Baptist Church of Oak Grove — whom the Lord sent to us to do the bulk of the excellent work on the renovation of our Restroom facilities and our Kitchen – came out and did some more work to dress up what they had started. So, God’s faithfulness is demonstrated through their doing what they said they were going to do! This is true integrity! Praise His Name! And, He displays this through His people. Marvelous! We love the way our Lord God does that! Thank you, Lord, for these dear friends and family in Christ. Please remember to pray for – and thank our Lord for – these faithful servants of His. We are slated to get new skirting around the trailer home that Sheri DeShepper presently lives in. It has needed this work done on it for many years. Please pray for this much needed task to get accomplished without any problems. Thank you. And, dear ones, since this is primarily a prayer reminder newsletter – once again, please remember to lift up before our covenant God — the young people who help us (and who will help us) on our staff. This is when we need to be seeking the Lord’s provision for 2019. We always need to fill some empty slots in our male and female helpers. We do love and appreciate all of you who so willingly and faithfully support this ministry in and with your continual prayers. We also are continually praying (and thanking God) for you. In addition, of course, when you are praying for us – please do not forget to pray for all the boys and girls whom the Lord has sent (and will send) to us to minister the gospel of God’s grace. They desperately need our unceasing prayer support! As the Spirit of God so moves – please help us in this way. This is what it’s all about! We love you and thank you again.